TV star Hina Khan, who was holidaying in London with family, came back home in time to celebrate Ganesh Chaturthi. The 30-year-old actress recently shared several pictures from the Ganesh puja, which she attended with her boyfriend Rocky Jaiswal. "Ganesh Chaturthi. Ganpati Bappa Morya," she captioned her post. For the puja, Hina opted for a white and golden salwar kameez, which she teamed with a pair of golden jhumkis. Rocky complemented her in a kurta pyjama set. The couple celebrated Ganesh Chaturthi with family and close friends in Mumbai, Rocky shared on Instagram. 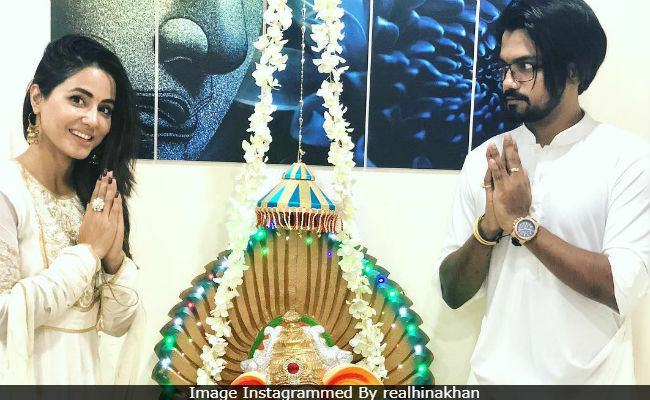 Take a look at the pictures from Hina Khan and Rocky Jaiswal's Ganesh Chaturthi celebrations. Hina Khan went to London last week. She was accompanied by her parents and brother. Before leaving the British capital, she posted these pictures along with a caption that read, "Yes, we make a lovely family, touchwood. So, a wonderful trip with this crazy bunch comes to an end. Thank you God for another beautiful memory." Here are some of the pictures from Hina Khan's London diary. Hina Khan last seen in the reality show Bigg Boss 11. Her next project reportedly is Kasautii Zindagii Kay 2, in which she might star as the prime antagonist Komolika. Hina Khan became a household name after playing Akshara in Yeh Rishta Kya Kehlata Hai. Meanwhile, Rohan Mehra and Kanchi Singh, Hina's former Yeh Rishta Kya Kehlata Hai co-stars, also took part in Ganesh Chaturthi celebrations with friends. Rohan Mehra was a participant of Bigg Boss 11.